FREE to attend and shop! FREE Vendor Space for Chamber Members! Fees apply to Non-Member Vendors. Click here to download the Vendor and Sponsorship Application. Join us for a summertime BLOCK PARTY in the FIVE FORKS area of Simpsonville! This outdoor event will be a great opportunity to learn about and shop with local businesses, crafters, and artisans in this rapidly growing area of town. There will be live music, food for purchase, and activities for the entire family! 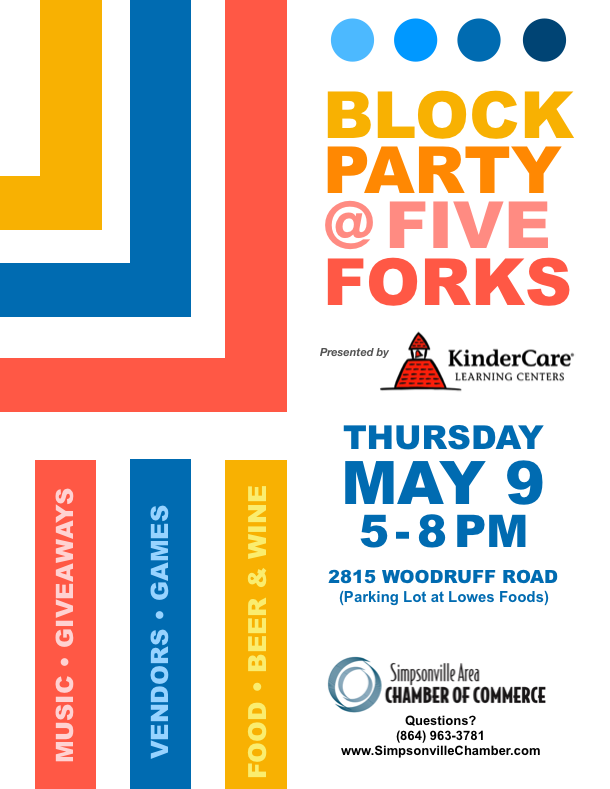 For business owners, this will be a great way to get your business in front of the residents and families in the Five Forks Community. Vendor spaces and sponsorships are VERY LIMITED so reserve yours today! !